Directed by Frenchman, Roger Vadim with a knowing screenplay by Terry Southern (Dr Strangelove, Easy Rider), and based on Jean-Claude Forest’s cult comic strip, 1968’s Barberella provided some light relief, melding science fiction, titillation, comedy and high camp on a scale perhaps never previously committed to celluloid. (Although 1980’s fevered Flash Gordon remake potentially runs it close). Set in the year 40,000, ‘astro-navigatrix’ (a somewhat diverting Jane Fonda) travels to a distant galaxy in search of missing inventor (Duran Duran), over-acted in spectacular fashion by Milo O’Shea. Kitsch classic or exploitative dross, Barberella was if nothing else, immense fun. Back on earth however, there were new cars (not) to be written about. Sixties sports saloons didn’t come finer wrought than Alfa Romeo’s 105-series Giulia berlinas, but towards the latter portion of the decade, a shift upmarket was embarked upon at Arese. The 1750 Berlina mated the existing Giulia platform and powertrains with both a larger (in wheelbase as well as overall length) bodyshell and a revised 1779cc version of Alfa Romeo’s feted twin-cam power unit when it debuted alongside the existing models in 1968. 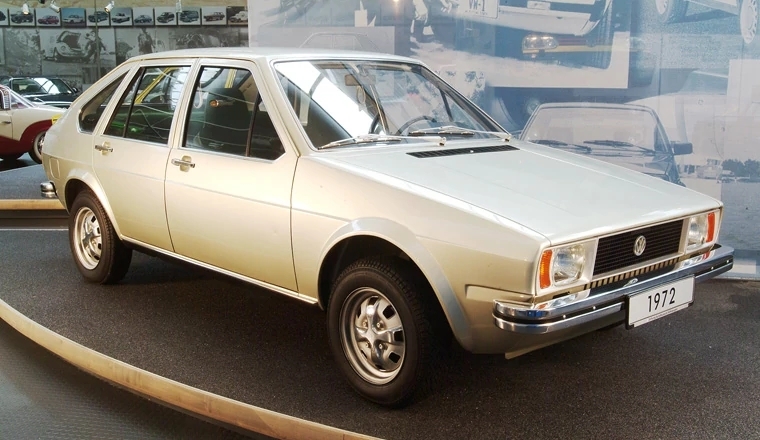 The 1750’s smoother looking body – it’s undocumented whether it proved as aerodynamic as centro stile’s original design – was the work of carrozzeria Bertone and was credited to Giorgetto Giugiaro. A satisfyingly neat piece of styling, the 1750, while thoroughly competent did illustrate that a consequence of smoothing out an existing styling theme is often a certain blandness. Well-regarded and long-lived (it continued until 1977 in 2000 form) the 1750 was in some respects the S-type to the Giulia’s Mark 2, to employ a Jaguaresque analogy. Having re-emerged as an upmarket version of the DKW brand, Audi was introduced to the market in 1965 as a four-stroke derivative of the Auto Union F102 series (with a little help from Mercedes-Benz). Re-established as a marque in their own right, Audi, by then under Volkswagen control, introduced the more upmarket 100 saloon in November 1968. 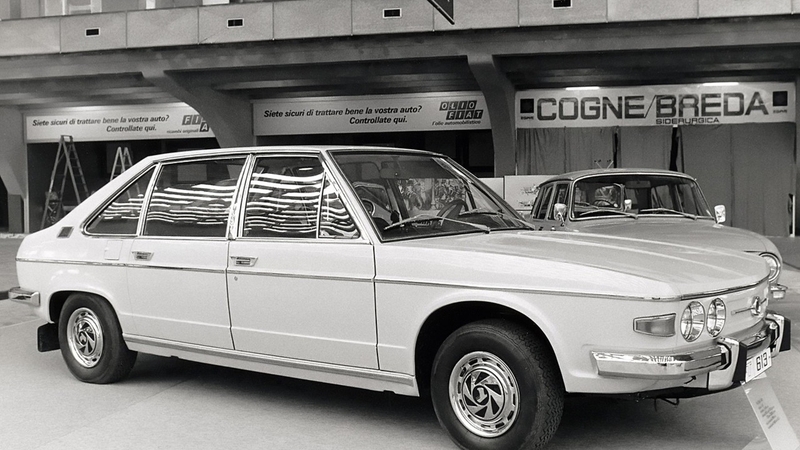 While less of an overt sports saloon than BMW’s Neue Klasse, the Audi 100 was aimed at a broadly similar monied clientele. With its 1760cc in-line four overhanging the driven front axle in what would become time-honoured Ingolstadt fashion, long-travel independent suspension, an attractive, modern body, mated to a high quality of finish, the 100 quickly powered Audi’s commercial revival. Ingolstadt may have produced more exciting, and certainly more rust-resistant cars in the years that followed, but it’s unlikely they made one as significant. Vorsprung, it could be stated, started here. Alfa Romeo wasn’t alone in looking further upmarket during this period. BMW, having abandoned the upper echelons following the demise of the unsuccessful 502, introduced a new range-topper, dubbed E3 in 1968. Debuting a new in-line six-cylinder engine of 2.5 and 2.8 litres coupled with a larger and sleeker bodyshell, The E3 was BMW’s pitch to gain a bigger, more lucrative slice of the luxury market. The in-house design was overseen by Wilhelm Hofmeister, with both Bertone and Michelotti believed to have contributed on a consultancy basis, the handsome and well proportioned E3 codified the BMW form vocabulary pretty much until the mid-80s and perhaps beyond. Introduced the same year was an even more attractive pillarless CS coupé version. Both models were instrumental in cementing perceptions of BMWs as upmarket driver’s cars par excellence, not to mention the added benefit to the Vierzylinder’s bottom line. Was there ever a more adroit big BMW saloon? While most European carmakers were moving up in the World in 1968, Citroën was, as could possibly be expected, looking in both directions at once. However, despite the double chevron being past masters in minimal motoring, the advent of the Ami and Dyane had left the 2CV concept open to accusations of decadence. The Mehari therefore could be read as an attempt to return to the reductio ad absurdum principles which defined the 1948 car. Initially the work of outside supplier, Société d’Etudes et d’Applications des Plastiques, the Mehari employed the platform chassis from the Dyane, including its 602 cc horizontally opposed twin, clothed in a lightweight body made from preformed ABS plastic. As Moke to Mini, so Mehari to Deux Chevaux; motoring reduced to the barest simplicity and all the better for it. Between 1968 and 1988, close to 145,000 found homes and survivors are highly prized today. At Sant Agata Bolognese, Lamboghini engineers, having overturned the performance car orthodoxy in no uncertain terms with Miura and Espada models, returned to more familiar territory with 1968’s Islero. A 2+2 GT of the classic idiom, it was intended as a direct replacement for the Touring-bodied 400 GT, a variation of the model which built Lamborghini’s reputation in the first place. Powered by the familiar 3939cc Bizzarrini/Dallara quad-cam V12, the Islero used a variant of the 400 GT’s tubular chassis, clothed in coachwork from carrozzeria Marazzi, an offshoot of the defunct Touring business. Named after the famous Miura-breed bull that killed Spain’s famous matador, ‘Manolete’ in 1947, the Islero’s subdued lines were said to have been a favourite of Ferruccio Lamborghini and was believed to be the carmaker’s choice of personal car. Only 225 Isleros of all versions were built, marking the end of a certain brand of understatement. Henceforth, all Lamborghinis would be outrageous. The origins of Opel’s 1968 GT are convoluted, but traces lie buried in Detroit amidst various Chevrolet and Pontiac sports car proposals. However the core of the car lies with Opel designer, Erhard Schnell, who, working in secret, envisaged a voluptuous, projectile-nosed shape with an abrupt Kamm-tail. Shown to the surprise of everyone, including Opel management in 1965, the car was greenlighted with a view to it going on sale in the US, which entailed some further Detroit input on the car’s appearance. Based on a contemporary Kadett B floorpan, suspensions and with a 1.9 litre engine from the larger Rekord, the GT was a successful junior sportster, with over 100,000 made, if one crying out for an engine and chassis which lived up to its attractive and distinctive body styling. Throughout the 1960s, Renault and Citroën appeared to track one another’s movements in minute detail. Rumours circulated about industrial espionage and similarities in design, but nothing was proven. However, the parallels between the 1968 Renault 6 and Quai de Javel’s Dyane were plain to see, and not simply in stylistic terms either. Just as the Dyane was squarely based on 2CV underpinnings, the 6 was a more upmarket derivation of the eternally popular Renault 4. Sharing key dimensions, chassis layout, engine and drivetrains, the upwardly mobile entrant from Billancourt was initially dismissed in some quarters of being an underpowered, tinselled Quatrelle, a matter partially remedied by the option of a larger-capacity 1108 cc engine in 1970. The Renault 6 might have been less of a mobile hairshirt than the 4, but it lacked the earlier and more long-lived car’s timeless charm. However, it rattled on until 1980, and a further six years in South America. While the Beetle had successfully conquered the known World, Volkswagen were keen not only to diversify, but it had become clear that Wolfsburg could not sustain itself on small inexpensive car lines forever. 1961’s Type 3 was a first, if unsuccessful attempt at a super-Beetle, but 1968’s Type 4 would see VW enter a more rarefied section of the market. The first Volkswagen to use Mac Pherson strut front suspension and coil springs in place of torsion bars, it was also the first to be offered in four door form. Architecturally similar to the unit fitted to the Type 3, the 411’s engine was also notably different, the 1679cc air-cooled flat four powerplant employing an over-square layout for increased low-end torque. The later addition of Bosch D-Jetronic fuel injection boosted power further and in this form would also see service in the Porsche 914. The 411 was not a massive success, owing to a combination of its eccentric appearance, (a derivation of the earlier Type 3) its rather lacklustre performance, questionable stability and arguably, the fact that customers were not expecting a rear-engined car at this price point. 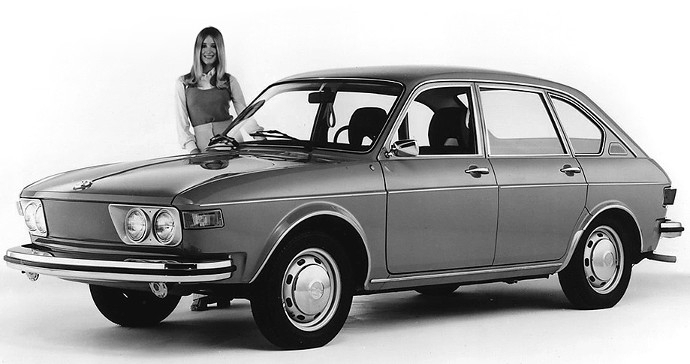 Nevertheless around 368,000 411/412s were built until production ceased in 1974, replaced by the Audi-inspired Passat. 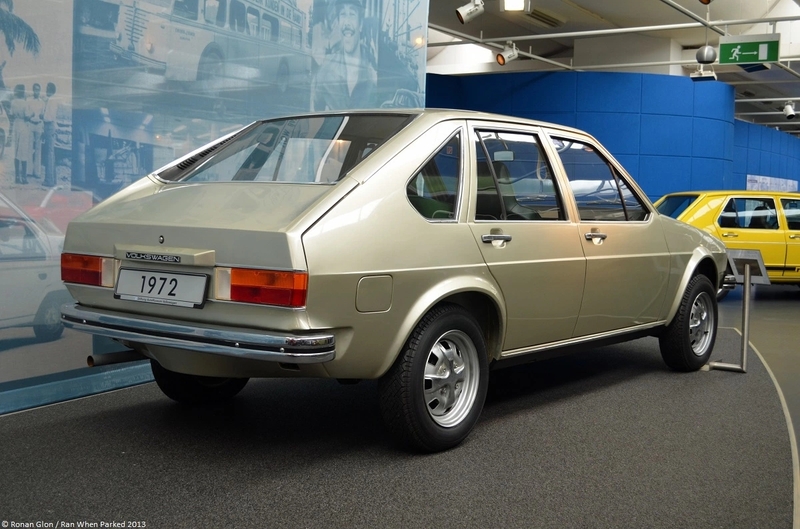 In Gothenburg, Volvo too were pushing upmarket and having presented the Volvo 144 saloon two years previously, 1968’s 164 was perhaps a logical progression. Technically, the 164 employed a 3.0-litre, in-line, 6-cylinder engine, an offshoot of the new 2.0-litre, 4-cylinder unit introduced for the 140-Series the same year. Stylistic changes were largely confined to the front end; the bonnet was longer, while a larger, more imposing grille treatment announced the presence of the range-topper to the World. Inside, seating was improved, the materials more luxurious and leather upholstery was available as an option. The 164 was subsumed in 1975 into the bodily similar 200-series. Returning once again to the celestial sphere, 1968 saw NASA’s Apollo 8 mission successfully orbit the Moon, becoming the first manned space mission to do so. Closer to terra firma (it hadn’t flown yet), Boeing’s supersized 747 airliner was revealed for the first time, heralding a new frontier in commercial air travel. 1968 may have been a turbulent year, possibly even a revolting one, but it brought forth no end of “excessive pleasure machines“, some of which we even got around to writing about. Comparing VW’s ‘Nasenbär’ with the Opel GT illustrates just how far behind the (styling) curve Wolfsburg was in those days. Similarly, the quality of Opel/GM Europe’s design in those days mustn’t be underestimated. Erhard Schnell obviously stayed at Rüsselsheim for the entirety of his career, but a great many other GM-trained talents went elsewhere and helped define the apex of European car design in the ensuing years and decades. Porsche in particular turned into some kind of catch basin for former Opel designers, who went on to create the most advanced German car designs of the 1970s. It is like a dream to me that Herbie was on board for the 411 programme, not to mention several other projects that hit the wall and slid messily to the floor at the time. Yet the 411/412 is not without a certain leftfield appeal – I recall my younger self being quite transfixed by them at one time – they were a comparatively rare sight on Ireland’s South coast ‘capital’. Allegedly, metallic paintwork was a no-cost option on these, which may account for why so many of them were finished in quite striking paintwork for the times and (if true) does suggest a certain lack of faith in the car along the banks of the Mittelkanal. On a different note, isn’t it striking, (a) how well resolved the Audi 100’s styling now appears and (b) how similar both it and BMW’s E3 were in formal terms? Minor correction by the way Daniel – EA266 had to the best of my knowledge, mid-engine layout. To many it is seen as a regrettable missed opportunity, while to others a bullet swerved. It does appear that a great deal of time and money were expended upon its development. Perhaps some of our more knowledgeable German readers can shed some further light? Speaking of the Italian carrozzieri by the way, there are suggestions out there that Pininfarina contributed to the 411’s styling. I can find no credible verification for this but looking at the headlamp treatment for ‘Farina’s 1963 Corvair proposal for Chevrolet, there are some (very) faint reflections. 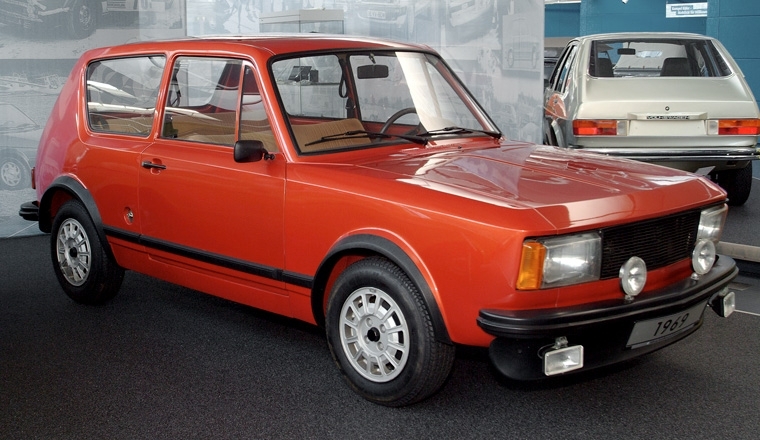 However, Cambiano also ‘contributed’ to the styling for the Austin Maxi, so I think we can safely say that any putative contribution is likely to have been of the most cursory variety. Those Passat tail lamps (photo above) are awfully similar to those fitted to the Citroen SM. Surely not? EA266 did not use any Beetle mechanicals. 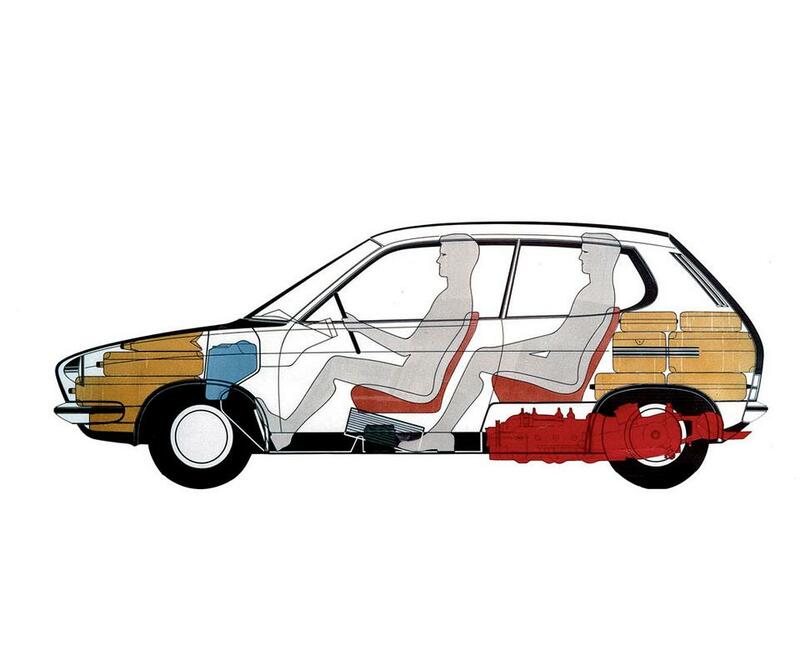 It was mid-engined with a longitudinally mounted water cooled inline four tilted by 90 degrees under the rear seat, placing passengers unusually high. The slats in the side panels in front of the rear wheels are the engine bay ventilation. As it was developed by Porsche, a water cooled flat eight was planned for Porsche versions. Rudold Leiding stopped EA266 at the last minute with all production facilities already being set up and developed Golf I in all of a hurry. My mistake regarding EA266 and thanks for the information, Eóin and Dave. It shares no body panels with the B1 Passat, but the overall shape is evolving. I imagine this predated the much more expedient and, presumably, cheaper decision simply to put a fastback tail onto the Audi 80. EA272 was originally meant to replace the Typ 3 models. It had a much longer wheelbase at 2,600 millimetres and a transverse engine that had nothing to do with later EA 827 derived motors. It also features a French-style trailing arm independent rear suspension and had a very roomy interior. Rudolf Leiding considered this car much too expensive to produce and decided that a smaller and cheaper car should replace the Beetle. That car was to have torsion beam rear suspension and Audi-derived engines and development was started as EA337 aka Golf I. One very important decision was to base the Golf on a much shorter 2,400 millimetre wheelbase similar to the Beetle’s so much fewer changes to the production lines were needed and dealers could use the old servicing equipment like early computerised service booths and dedicated hydraulic hoists. The EA337/Golf was closely designed around the specific and unusual production processes of the Beetle to speed up development and keep necessary investment in production equipment lower. A replacement for Typ 3 and 4 was derived from the then new Audi 80 B1 by giving that car a rear very similar to EA272’s. This prototype shows Giugiaro’s penchant for adventurously inclined windscreens. Original designs for Golf I showed this feature, too, with VW reduding the angle late in development to reduce reflections. It looks a more compact car than the one which entered production and one would have to say, Giorgetto’s proposal (and it screams Ital Design) has it on purely aesthetic grounds.